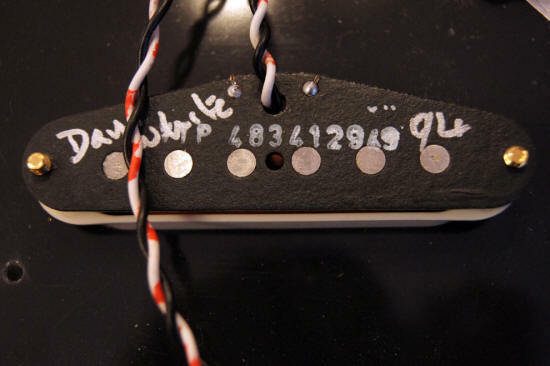 David White made Stratocaster and hum bucker pickups for a long time. The Fender ones are featured and reviewed here. Although very hard to find they are some of the best pickups you can lay your hands on at any price. It's likely you have never heard of David White. That's understandable but it's also a pity because David was one of those innovators that come along from time to time and they somehow move the goal posts just enough to make everyone else sit up and take notice. So much so, that it is rumoured that David shook the feathers of one Fender Musical Instruments with his really great pickup manufacturing. But that was then (early 90's) and this is now. Unfortunately David passed away some time ago so there will be no more David White pickups likely soon. But he DID leave a legacy for anyone to simply pick up on (no pun intended) and realise that David was indeed far from the madding crowd when it comes down to pickups. I distinctly remember seeing a review of these pickups in the UK magazine 'Guitarist' back in the early 1990's when pickups were being changed faster than the price of petrol (gas) increases at the pumps these days. You know the way it goes... these are the 'new' thing around and are more awesome than the last lot we made last week... we just used a different name and hey presto - we're selling millions. But the truth is, that's not the way it was with the David White pickups. I was very sceptical at first, but I did splash out on two new units and indeed sent of a 62 stratocaster pickup for reworking because it had 'shorted out' internally - the result was about 1/4 the output that should be there. But David had a good reputation (I did my homework) so I sent it down to him. How good was the Build and Quality of those pickups? Actually I had a bit of a dilemma. I had sent David my very rare and very expensive 62 original pickup for a rewind and refurbish. What I received back worried me somewhat. I had ordered two other pickups that I specified as 62 (to make up a set) and they all arrived back with me in a nice shiny plastic case with all the blurb. But where was my 62 pickup? I looked very closely, but all I saw was some red and white wiring where the original stuff had been fitted to what looked like a brand new pickup. What's more... the others looked the same. I immediately called David White and demanded to know where my beloved 62 pickup was! David immediately told me that in fact I had been sent back the 62 which had been completely reworked and that David had made two new pickups that were identical except for the resistance (the other two were middle and neck) and were indeed exact copies in all other respects. Well, you can find out yourself... I have posted a video on my video page and on YouTube so you can hear them yourself. Not everyone has the same perception of what a 62 stratocaster pickup should sound like - some think 'Hank Marvin' while others might even think Hendrix and of course many other musicians who wield a stratocaster. That video along with others on my YouTube channel show what I get from them. The sound is hard to describe really but listen and you will see what I mean. And to think that these pickups were just about $50 (£33.00) each! 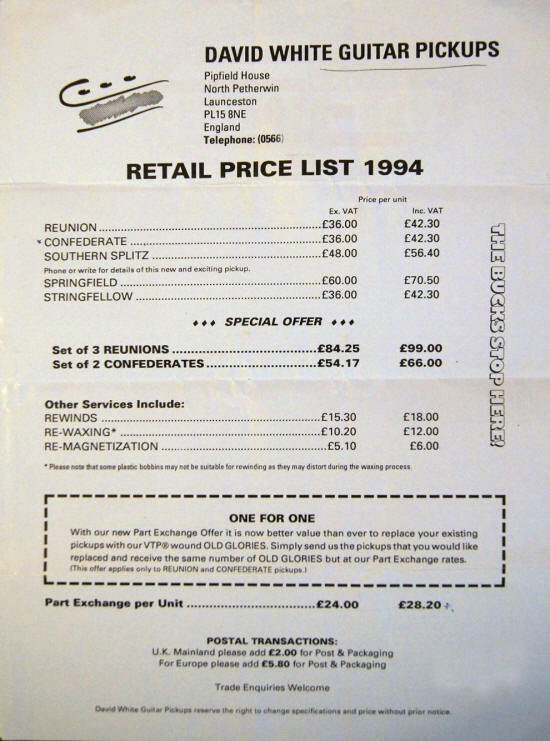 Well I guess that things have moved on a little from those days.. that sounds almost too good to be true though... but that really was the price then. But not the price now! 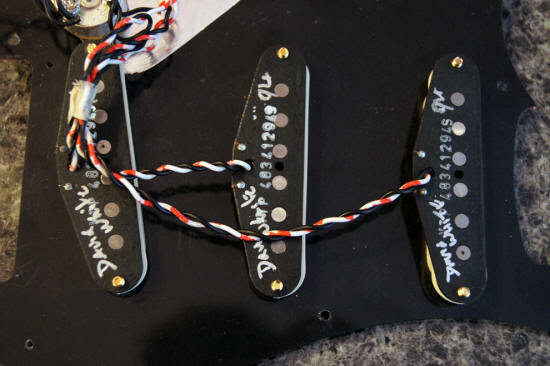 What was David's 'secret' to making those stratocaster pickups? 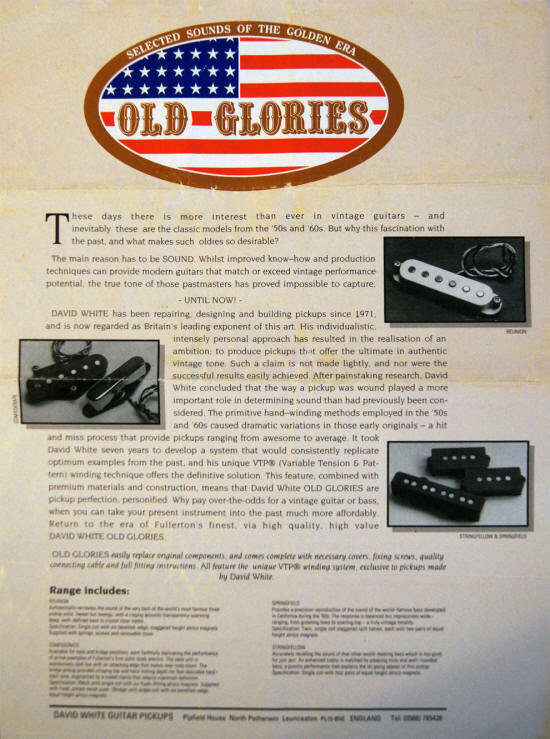 David had been working on pickups for a long time - indeed since 1971. Now during that time David learned a lot about pickups. So much so that he developed a machine for winding pickups in a very specific way, indeed a way that has not been replicated since his untimely passing. With all these other guys around today surely someone has easily bettered his techniques right? What about Bare Knuckle Pickups, Seymour Duncan or others? Well, actually no, you see, each and every pickup maker has his own techniques about how to make the definitive pickup. David developed a unique VTP scheme of winding which related to Variable Tension and Pattern. Bear in mind that while some makers use scatter wound pickups there is probably no variance on tension of the wire in the windings and I think that David did indeed pin down something a little more than just 'scatter wound' stuff. The truth is, there's not actually any one pickup maker getting it right these days - they all do their own thing and they all have their own answers. Some better than others but it's a matter of taste. Take Bare Knuckle for example - they like to promote random winding of the pickups - it changes the capacitance of the pickup effectively - scatter wound equals more treble. But I don't think tension comes in to their equation except as a constant. I think Seymour Duncan's approach is different also. So, what if I find some? Well if you do you want to really snap these up immediately.. they are one of those things that you don't really consider as being any good... probably because you have never heard of them. So what - does that make a pickup bad? of course not. These David White pickups are just one of those anomalies that come around from time to time where someone was really on the pulse of what made a pickup sound the way it did back in the 'old days'. Play them clean and they chime like no others... play them driven and you are in stratocaster heaven. What I find different is that most stratocaster pickups are not easy to use with some of my techniques - tapping for example. Often the pickup in a stratocaster is weedy and does not 'carry' that sound like it really should. But if you check the 'Teaser video' on my video page you can see that when I tap with these pickups it becomes effortless. And that's a real difference where stratocaster pickups are concerned. 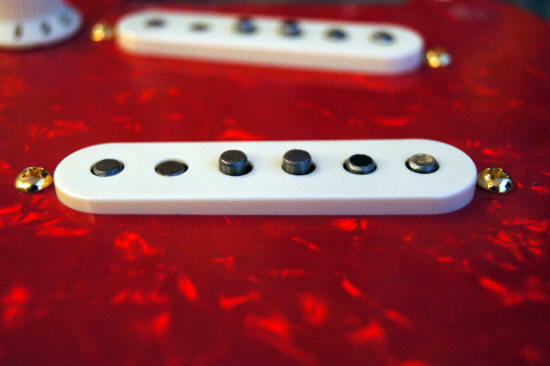 So how do you rate the David White Stratocaster Pickups? Actually these are the best stratocaster pickups I have ever played at any price - ever. They are truly THAT good. Now while the sounds are subjective and not everyone will agree that's good. Because sometimes you can get a bargain - especially if the seller of a set of these thinks they are not too cool for his style of playing (or something like that). My advice? BUY THEM... NOW! I don't offer Bulls**t on this site as a view when reviewing ANY product so don't expect to get any here... you want dealer sites for all that - and even some manufacturers I could think of. But I'll say it again - buy them. These for a Stratocaster are rated 10:10 AND THEY ARE ONE OF THE FEW THINGS THAT I HAVE EVER RATED THIS HIGH. So for the Duncan's, the Bare Knuckles, the Dimarzio and a whole bunch more now you know what David used to do.